While I am a huge fan of Thanksgiving and staunchly oppose Christmas Creep, I am becoming more and more of a BIG GIANT CHRISTMAS CRAZY PERSON. A few years ago, I happened to be unemployed and childless at Christmas, so I went origami crazy and decorated our whole tree with handmade papercrafts. 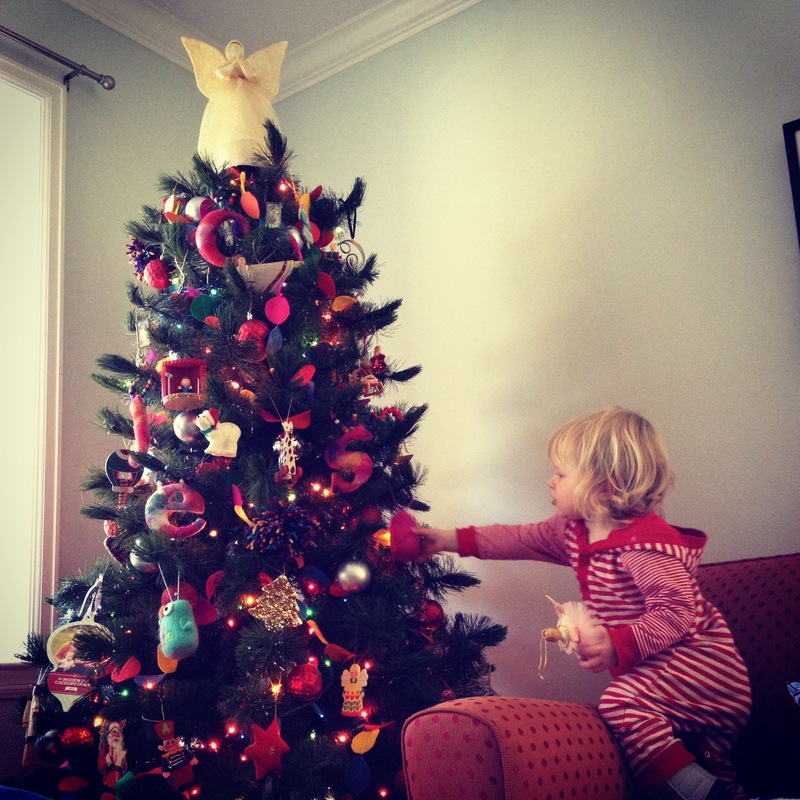 This year, I have toddlers, so when a kid-free day opened up during the week of Thanksgiving, I went ahead and put up the tree, BEFORE DECEMBER. Starting on December 1, our constant soundtrack has been my playlist of some 250 Christmas songs, much of which is hipsteriffic remakes of carols accompanied, I’m sure, by mustachioed dudes playing banjos, possibly while wearing vests, obtained free via Noisetrade. I’ve been working like an elf on homemade tree skirts, cinnamon ornaments, felt garlands, and lots of handmade presents. Our tree, which was (gasp) up before Thanksgiving this year. 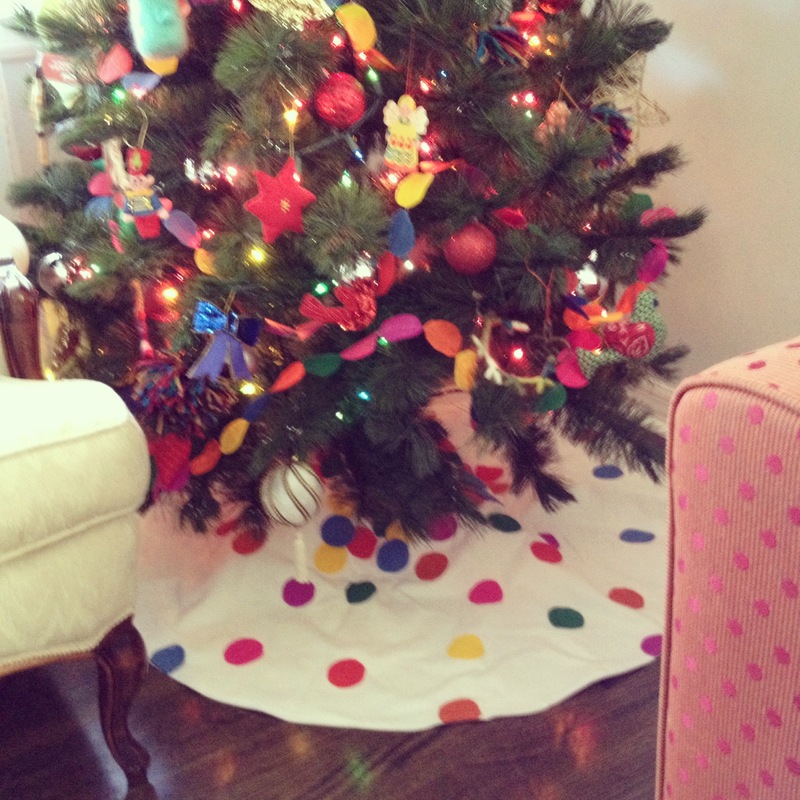 I made this tree skirt, inspired by one I saw from The Land of Nod. But the surest sign that I’ve gone round the Christmas bend is the nativity. Rachel Held Evans has a hilarious post today about the conundrum of a childless progressive couple trying to choose a nativity scene. Where to find a biblically accurate, fair trade, child safe nativity? It seems such a fraught decision. Pre-kids, the nativity I chose was a fair trade Peruvian one which features llamas. Perhaps not biblically accurate, but it makes me smile. Yep. That’s a plastic, light-up, noise-making nativity, in the home of the lady whose rules for her kids’ toys include avoiding plastic and things that make noise. And I don’t care. I love the Little People Nativity. My kids can’t break it, they love to play with it, and when you press the Baby Jesus and he lights up (?!) 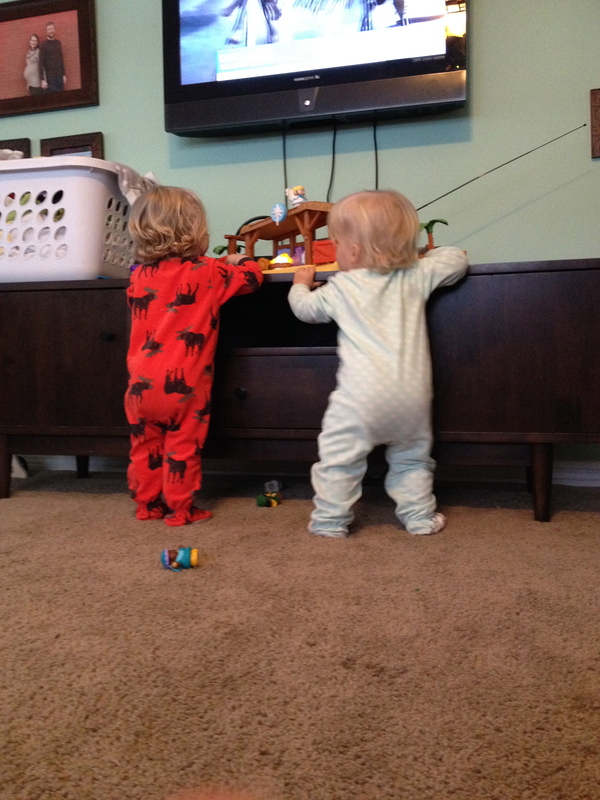 and the whole thing plays Away in a Manger and Silent Night, well, my kids dance and sway and clap their hands and the entire thing becomes more than worth the $20 I spent on it in the Fisher Price Labor Day sale. And can you spot my favorite part? Yep. The purple hippo. 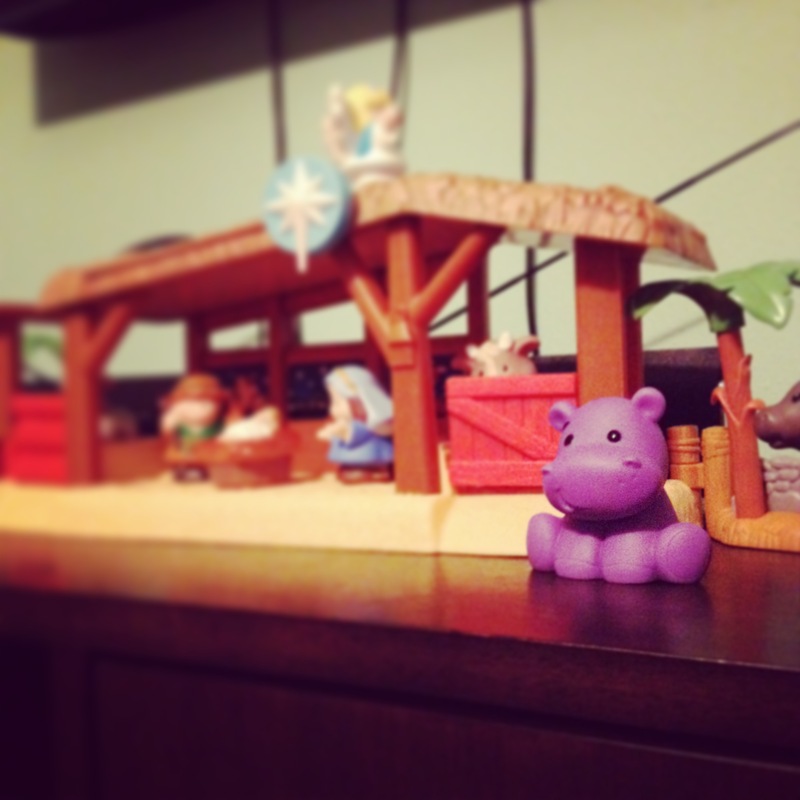 Strangely not included in the original set, my children decided the purple hippo from their bath toys really needed to be present at the birth of our Lord and Savior Jesus Christ. It kind of reminds me of the nativity scene lobsters from “Love Actually” and definitely reminds me of my sister, whose favorite Christmas song is “I Want a Hippopotamus for Christmas.” It makes me smile. How much has changed. How far I’ve come. But you know what, if they coulda, I’m sure the hippos would have followed a star all the way to Bethlehem too. They could have hung out with the lobsters. Hours of fun with the plastic, noise-making, non-historically-accurate but much-beloved Little People Nativity. My SIL brought us back a fairly traded Peruvian nativity complete with llamas from one of her trips to Peru! We now have one my aunt made for us with clay. A loves it and always wants to show us the moo and baabaa in it. Maybe making one with the bufflogals should be a project for you one Christmas! we have had a nativity fox and a nativity bracheosaurus. This year we have a christmas unicorn. Foxes are my face, Accidental Devotional, so I’d totally be down with a nativity fox! Reading your posts makes my heart happy. Thank you. We don’t have a nativity – we have ‘The Jesus People’. It’s a Home Interiors nativity remarkably similar to Precious Moments that my husband and I have had practically since we got married 32 years ago. Our youngest, a daughter (now 9), has always called them the Jesus People and it has stuck! Two angels we got at Goodwill have joined our Jesus People this year. An Aunt Gigi approved nativity set! Man I am going to miss my babies this Christmas, but I have wrapped their presents with love & I hope they get great joy finding them under the Christmas tree even after the festivities are passed.